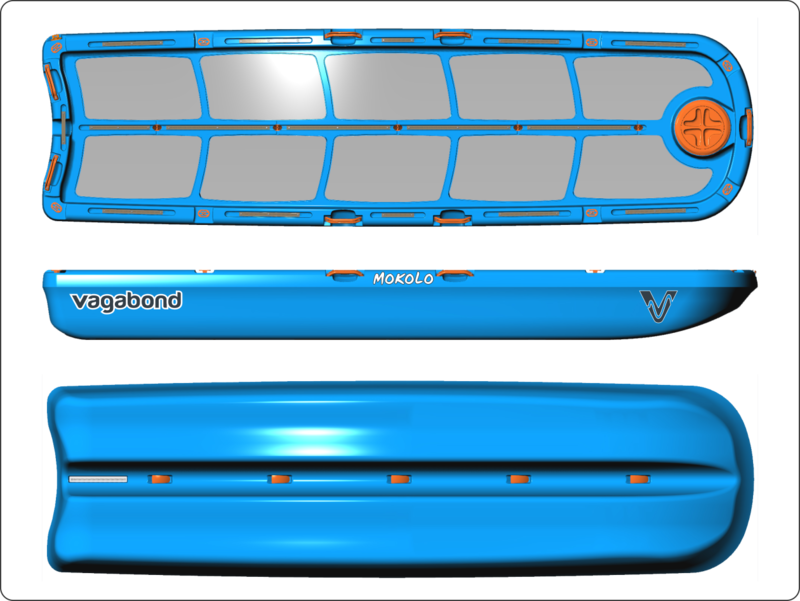 The Mokolo is a blank canvas; a large platform that can be customised and used for any activity on flatwater. Paddle it standing up or sitting down, load it with a cooler box, a friend and your dog, kit it out for fishing expeditions or just float it on your swimming pool to spend the afternoon on your belly reading a book. The hull of the Mokolo has a double-pontoon design which has been created for ultimate stability. The concave bottoms and sheer volume of these pontoons mean that you can stand and walk around on the deck as if you’re on a floating jetty. We’ve covered the deck in non-slip EVA foam pads. The edge of the deck is a raised ‘lip’ to prevent your gear accidentally sliding overboard. Smaller items like keys and mobile phones can be stashed within a light drybag in the watertight 8″ Day Hatch for easy access. Our most exciting feature is the 15 sections of aluminium deck rail on the sides and down the centre of the deck. To these rails, you can attach seats, crates, fish finders, GPS units, rod holders, extender poles for cameras and anything else you would like to fix to the deck. For other items, attach bungee cord, rope or straps to the Multifits to secure gear to the deck. More than one Mokolo can be connected together too. YES! You can go kayak fishing with a friend, connect your Mokolos together and enjoy double-the-space for your day of fishing.